Missouri at Tennessee: Consider it a statement on the dreadful nature of this week’s SEC slate that our top game involves two unranked teams. 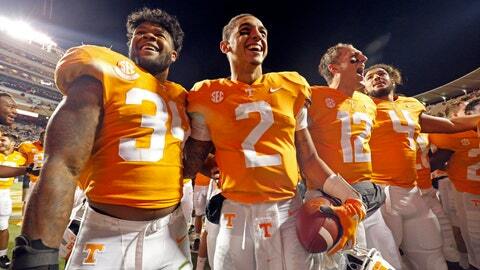 A victory Saturday would make Tennessee (5-5, 2-4 SEC) bowl eligible, a giant step forward for a team that went winless in SEC competition last season. Missouri quarterback Drew Lock has 11,342 career yards passing and needs to throw for just 187 yards to overtake former Georgia quarterback David Greene and move into second place on the SEC’s all-time list. Texas A&M quarterback Kellen Mond vs. UAB’s pass rush: The Blazers have recorded a school-record 38 sacks to match Northern Illinois for the highest total of any Football Bowl Subdivision team. UAB’s defense is also good at the right times, leading the country in third-down defense and fourth-down defense. Opponents are converting first downs on only 24.2 percent of their third-down attempts. Texas A&M has lost two of its last three games, though the Aggies bounced back with a 38-24 win over Mississippi last weekend. Mond threw for three TDs and ran for another score in the Ole Miss game. No. 1 Alabama (No. 1 College Football Playoff) has 24 straight home wins to match a school record previously set from 1971-74. Alabama will try to earn a 25th straight home win Saturday against The Citadel. … No. 15 Florida (No. 13 CFP) has rallied from at least 17 points down in victories over Vanderbilt and South Carolina. The only other SEC teams over the past 15 seasons to have multiple 17-point comebacks in the same year are Auburn in 2000, Arkansas in 2011 and Tennessee in 2016. … No. 20 Kentucky (No. 17 CFP) hasn’t scored more than 17 points in a game since September. … No. 5 Georgia’s D’Andre Swift has run for a touchdown of at least 77 yards in each of his last two games. He’s the first Georgia player since Herschel Walker in 1980 to have two touchdown runs of at least 75 yards in the same season. … Texas A&M’s Braden Mann is averaging 50.95 yards per punt attempt, which puts him on pace to break the NCAA single-season record for anyone with at least 36 punts. The record is currently held by Chad Kessler, who averaged 50.3 yards per punt for LSU in 1997. … Ole Miss’ A.J. Brown went over the 1,000-yard mark in receiving last week in a loss to Texas A&M. Brown is the first Ole Miss player ever to have two 1,000-yard receiving seasons. Tennessee is coming off a 24-7 victory over a ranked Kentucky team but is still a 6-point underdog at home against Missouri. Tennessee needs one more win to become bowl eligible, while Missouri’s already bowl eligible. … Mississippi State is a 21-point favorite at home over Arkansas. The 25th-ranked Bulldogs (No. 21 CFP) are coming off a 24-0 loss to top-ranked Alabama. Arkansas is winless in the SEC, but played No. 10 LSU (No. 7 CFP) close last weekend before falling 24-17. Vanderbilt’s Ke’Shawn Vaughn has rushed for 354 yards and four touchdowns over his last two games. Vaughn ran for 172 yards and three touchdowns in a victory over Arkansas, and the Illinois transfer followed that up by rushing for 182 yards and one touchdown on just 15 carries in a 33-28 loss to Missouri. Vaughn next faces an Ole Miss team that is allowing the most yards rushing per game (215.6) and yards per carry (4.94) of any SEC team.